1 For the salad: Soak the corn overnight in plenty of water. Drain and soak in sugar water for 15-20 minutes. Drain. Peel the avocados, remove the pit and dice the flesh. Rinse the parsley, shake dry, and chop finely. Rinse the line, zest and squeeze the juice. 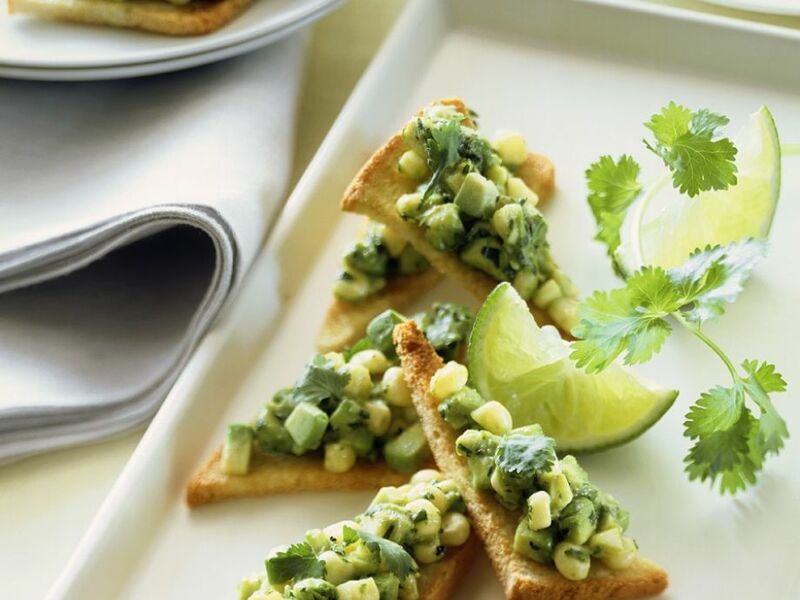 Place avocado cubes and corn in a bowl. Add the parsley, line zest, lime juice, and vinegar. Season with salt, pepper, and chili. Infuse for 1 hour. 2 Toast the bread until crisp and top with the avocado salad. Cut in half crosswise and arrange on a plate. Serve garnished with lime and parsley.